Major Heather Newberry, United States Army Reserves, has over 15 years of continuous military service and 10 years of flying experience. During her service she has been deployed on three combat tours. She has over 1,000 hours of rotary wing flight experience, with over 500 combat flight hours. 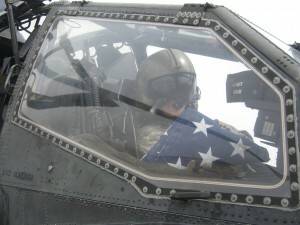 Major Newberry served her country during Operation Iraqi Freedom and Operation Enduring Freedom flying AH-64D Apache attack helicopters with the 4th Infantry Division. She was commissioned in 2000 and served in the U.S. Army until 2012. She continues to serve in the U.S. Army Reserves in the G5/7 Future Planning Section, Pacific Training Command, 75th Training Division, Camp Parks, CA. During her service based at Camp Taji Iraq, Major Newberry supported Multi-National Division—Baghdad (MND-B)—where she flew over 300 combat hours in 2005-2006, and over 200 combat hours in 2008-2009. During her service in Afghanistan she was based at Camp Marmal, a NATO base at the airport Mazar-i-Sharif (MEZ) in the northern part of Afghanistan, where she flew over 100 combat hours supporting operations in northern Afghanistan. Newberry’s extraordinary awards include military recognitions such as: Bronze Star, Meritorious Service Medal, Air Medal with 2 oak leaf clusters and others.